A wet appliance is any appliance that uses water to do its job. These appliances include washing machines, dishwashers, cloth dryers, and others. Cold appliances consist of a thermally insulated compartment and a heat pump that transfers heat from the inside of the fridge to its external environment so that the inside of the fridge is cooled to a temperature below the ambient temperature of the room. Focus on new product launches and continual strong focus on the most profitable product categories has increased the market share of premium brands. In the global wet and cold appliances market, the domestic refrigerator segment has the largest market share due to major adoption of refrigerators in regions such as Europe and Asia Pacific. Also, rise in consumer spending power and easy availability of financing schemes tend to drive the growth of the domestic refrigerator market. The global wet and cold appliance market is projected to reach market size of about US$ 200.8 Bn by 2026, with an average growth rate of around 6.2% during the forecast period. 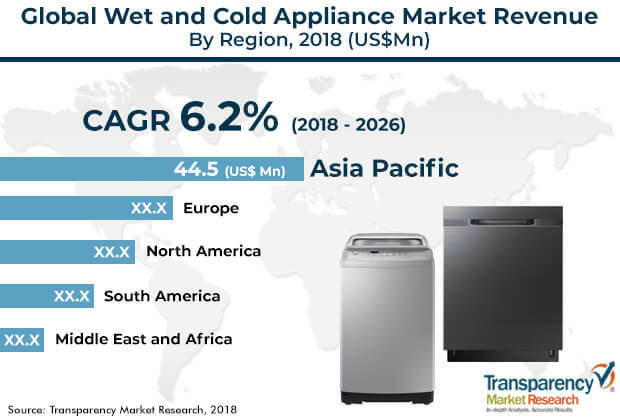 The global wet and cold appliance market is anticipated to be driven by factors such as rise in disposable income, change in lifestyles, and increased penetration of Internet of Things. Rise in disposable income is creating increased demand for wet and cold appliances which in turn is expected to accelerate the growth of the wet and cold appliance market. Washing machines and refrigerators are garnering an increased share in the market due to reduction in prices and higher disposable incomes. Rising incomes in urban areas characterized by purchasing power have led to high product demand. Increasing globalization and automation has made manufacturing economical, enabling companies to reduce the cost of appliances such as refrigerators, washing machines, and dishwashers for consumers. Furthermore, progressively changing lifestyles in rural areas together with the rising disposable income of consumers is expected to build a lucrative roadmap for domestic refrigerators industry trends over the forecast period (2018-2026). The outlook for the wet and cold appliance market looks positive. Comparatively better economies across all the regions, with improvement in lifestyle and more disposable income are some of the main economic drivers of growth in the wet and cold appliance market. Consumers nowadays prefer energy efficient wet and cold appliances. There are several reasons attributed to the positive outlook in the wet and cold appliance market; energy efficiency is one of the main reasons. Energy efficient appliances reduce energy consumption while increasing appliance performance. The main reason for the growth in adoption of wet and cold appliances is the desire to own a relatively intelligent, smart, and energy efficient appliance. Reduced energy and water consumption of major appliances is one of the key drivers for the growth of the wet and cold appliance market across regions. Energy efficiency programs are encouraging upgrade purchases of such appliances. Several companies are deploying energy efficient technologies to reduce high energy consumption by avoiding unexpected inrush of current. Untapped regional markets such as Asia Pacific, South America, and Middle East & Africa are expected to fuel the demand for wet and cold appliances. This is primarily due to rise in consumer awareness and improvement in living standards in these markets. Domestic refrigerators and washing machines are expected to witness major demand in Asia Pacific, South America, and Middle East & Africa as these models are anticipated to gain popularity due to the energy and environment-related advantages associated with them. The domestic refrigerators market is gaining significant traction across Asian countries such as China, Thailand, India, and Indonesia. The rising penetration of retailers in these countries has driven the demand for energy-efficient refrigerators. Also, the growth in urbanization is anticipated to directly impact the growth of wet and cold appliances positively. Internet of Things is a new development. It refers to the set of systems and devices that connect real-world sensors to the Internet. Communication is established through Internet of Things so users can access information about refrigerators and washing machines anywhere and at anytime. Appliances such as refrigerators, washing machines, and dishwashers are mostly used in the kitchen. Present systems use complex technology that raises its complexity. The smart refrigerator is designed so that it modifies any current normal refrigerator into a smart refrigerator which is cost effective. In this highly advanced era, Internet of Things proves to be a smart, economic, and efficient platform for implementing automation. Controlling and monitoring of washing machines and refrigerators using IoT can be implemented and they can be used efficiently. Some of the key players profiled in the global wet and cold appliance market are AB Electrolux, Videocon Industries Ltd., Haier Group Company, LG Electronics, Philips Electronics, Whirlpool Corporation, Panasonic Corporation, Robert Bosch GmbH, Sharp Corporation, Sub-Zero Wolf, Daewoo Electronics Corporation, and Samsung. This report on the global wet and cold appliance market provides analysis for the period 2016–2026, wherein 2017 is the base year and 2018 to 2026 is the forecast period. Data for 2016 has been included as historical information. The report covers market dynamics including drivers, restraints, opportunities, and trends expected to influence the growth of the wet and cold appliance market during the said period. The study provides comprehensive analysis on market growth throughout the above forecast period in terms of value and volume estimates (US$ Mn and Million Units) across different geographies. Digitalization plays a vital role in enhancing consumer power. Digitalization also offers considerable opportunities to develop increasingly advanced products such as connected products. In addition, connectivity and digitization enable companies to better understand the consumers and to tap into new business models. Several companies such as LG and Samsung are getting ahead of the smart technologies revolution by offering products including smart washing machines and smart refrigerators. Companies are offering more technologically advanced products in order to serve consumers better and make their life simpler due to shift of consumers toward digitization. For instance, the latest model of LG's refrigerator has a 29-inch Windows 10 surface computer to make the screen transparent, so consumers can see inside the fridge. The wet and cold appliance market has been segmented on the basis of type and geography. Based on type, the market has been classified into dishwasher [built-in standard Dishwasher (drying with ventilation, drying without ventilation), countertop dishwasher (drying with ventilation, drying without ventilation), drawer dishwasher (drying with ventilation, drying without ventilation)]; cloth dryer (vented, condenser); washing machine (front loading, top loading); domestic refrigerator [top freezer (static cooling, dynamic cooling), bottom freezer (static cooling, dynamic cooling), side-by-side (static cooling, dynamic cooling), built-in (static cooling, dynamic cooling), compact (static cooling, dynamic cooling). In terms of geography, the report classifies the market into North America, Europe, Asia Pacific (APAC), Middle East & Africa (MEA), and South America. The report highlights key developments in the wet and cold appliance market. Porter’s Five Force Analysis which identifies bargaining power of suppliers, bargaining power of buyers, threat from new entrants, threat from substitutes, and degree of competition is included in the report. Value chain analysis which shows workflow in the wet and cold appliance market and identifies raw material service providers and distribution channels are covered in the report. Segment trends and regional trends are part of the report. It also covers segment-wise comparison matrix, incremental opportunity analysis, and market positioning of key players for all regions covered in the scope of study. The report includes competition landscape which covers competition matrix and market share analysis of major players in the global wet and cold appliance market based on their 2017 revenues, and profiles of major players. Competition matrix benchmarks leading players based on their capabilities and potential to grow. Factors including market position, offerings, and R&D focus are attributed to a company’s capabilities. Top line growth, market share, segment growth, infrastructure facilities, and future outlook are attributed to a company’s potential to grow. This section also identifies and includes various recent developments carried out by leading players of the wet and cold appliance market. Company profiling includes company overview, major business strategies adopted, and key developments. The companies profiled in the global wet and cold appliance market include AB Electrolux, Videocon Industries Ltd., Haier Group Company, LG Electronics, Philips Electronics, Whirlpool Corporation, Panasonic Corporation, Robert Bosch GmbH, Sharp Corporation, Sub-Zero Wolf, Daewoo Electronics Corporation, and Samsung.